In the previous Google Maps Android API Getting Started Tutorial: Part 1 tutorial, we had made new android project with Google Maps Activity, created a key for google map application then ran that to see the google map in our application. Google map allows you to perform lots of customization. In this tutorial, you will learn to make android app to display curse in current location using Google Map Android API V2. Many corporate android apps make a page like contact us, about us and they display company location by highlighting actual company using google map. If you are directly in this tutorial I recommend you to follow Google Maps Android API Getting Started Tutorial: Part 1 before going through this because this is continuous tutorial after that. In the previous tutorial we had displayed default google map in android application and here we will customize little bit and add map cursor to our location and add some text. Open your MapsActivity.java file of Google Maps Android API project and add a line of java code mMap.setMyLocationEnabled(true); under onMapReady method. Change the line LatLng sydney = new LatLng(27.746974, 85.301582); with your location latitude and longitude. Replace 27.746974 with your latitude and 85.301582 with longitude. 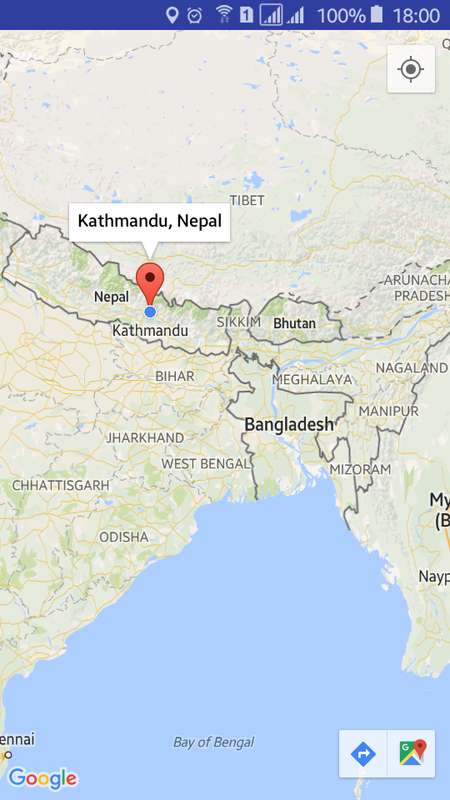 In this tutorial, I have used the latitude of Kathmandu, Nepal you can use your own. MapsActivity.java file will look like below. All other files are same that as previous. We don’t need to change other files to display current location in google map. Now run your Get Current Location - Google Maps Android API Tutorial: Part 2 application, you will see a cursor in google map with your current location. If you click on the cursor some texts appears that we place in our java activity file.